why do we celebrate st. patrick's day? what does a saint have to do with green beer and shamrocks? and what does a man born in 5th century britain have to do with ireland in the first place? read on to learn more. st. patrick was born in [roman] britain near the end of the 4th century and is said to have died on march 17th 460. when he was sixteen years old, patrick was taken prisoner by a group of Irish raiders who transported him to ireland. he spent six years in captivity working in solitude as a shephard. patrick turned to religion to guide him and it is believed that this is the time when he began to dream of converting the irish people to christianity. when he escaped from capitivity, patrick returned to britain. he wrote that he experienced a revelation wherein an angel told him to return to ireland as a missionary. patrick subsequently began a long religious training and was ordained as a priest. he was sent to ireland to minister to christians living in ireland and to begin to convert the irish. familiar with the irish culture, st patrick used this knowledge to incorporate traditional irish ritual and imagery into his teachings to make it more natural for the irish (who were mostly involved with nature-based pagan ritual at the time). by the 8th century, he became widely known as the patron saint of ireland. march 17th is st. patrick's religious feast day. it was placed on the universal liturgical calendar in the catholic church in the early part of the 17th century, although it was widely celebrated in the local irish church from a much earlier date. it is a holy day of obligation for roman catholics in ireland, meaning they are obligated to attend mass on this day. the holiday almost always falls in the season of lent. often bishops may grant an indult from the Friday 'no meat' observance if st. patrick's day falls on a friday. when March 17th falls on a Sunday, church calendars move the holiday to the following monday. non-religious st. patrick's ["st. patty's"] day celebrations are generally themed around everything 'irish' and the colour green. both christians and non-christians around the world celebrate the secular version of this holiday by wearing green, eating irish food or green food and drink and attending parades and parties. in ireland, st. patrick's day has traditionally been a religious occasion without any secular observance. up until the 1970s, irish laws mandated that pubs be closed on March 17th! in 1995, the irish government began a national campaign to use the holiday as an opportunity to drive tourism and showcase ireland to the rest of the world. traditionally, st. patrick is associated with the colour blue, specifically 'st. patrick's blue'. 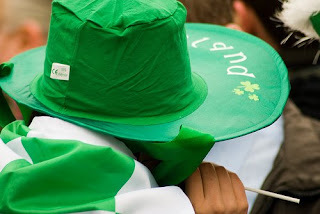 the change to ireland's association with green rather than blue probably began around the late 18th century and may have gained its prominence through the phrase 'the wearing of the green' which means to wear a shamrock on your clothing. it is said that st. patrick used the shamrock to explain the holy trinity to the pre-christian irish, referencing its 3 leaves. wearing a shamrock on your clothing has long been viewed as a symbol of proud irish nationalism. americans celebrate the holiday by wearing green clothing. traditionally, those who are caught not wearing green are pinched. do you celebrate st. patrick's day? how do you mark this festive occasion?